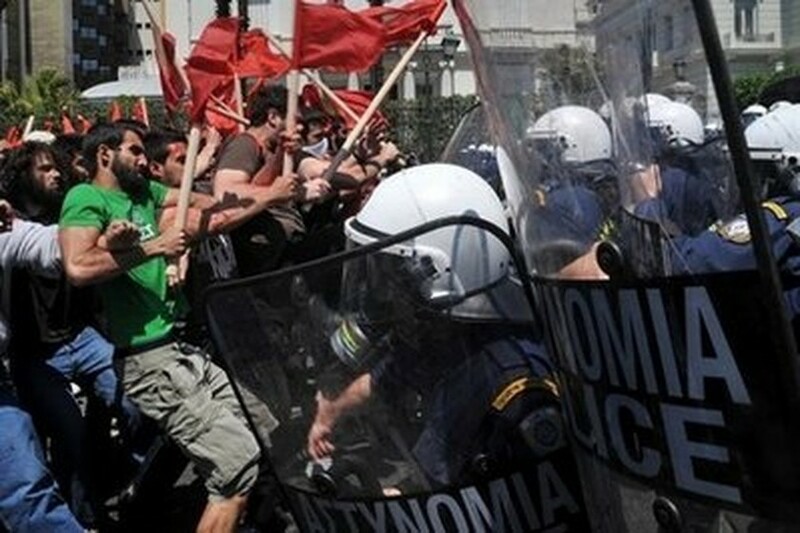 Hundreds of thousands of people joined May Day marches across the world, as police and protestors clashed in debt-riven Greece and a bomb killed a World War II veteran in Russia. In Athens several dozen youths, some armed with sticks, charged a line of anti-riot forces, prompting police to respond with tear gas as thousands of protestors swarmed the city to protest budget cuts forced by the debt crisis. Police said about 15,000 people joined the Athens marches to vent anger at deep budget cuts which will hit public sector workers particularly hard. "It's the biggest attack on workers for centuries. They want to return us to the nineteenth century," said one protestor, printer Ericos Finalis. Demonstrators clash with police during a massive demonstration to protest against austerity measures and marking May Day in Athens. In the northern city of Thessaloniki, police also fired tear gas at youths who attacked banks and businesses using iron bars during a protest that police said drew about 5,000 people. In the United States tens of thousands of protesters marched through Los Angeles in a peaceful May Day rally against a tough new immigration law in Arizona that has triggered a nationwide outcry. An estimated 60,000 marchers turned downtown Los Angeles into a sea of red, white and blue, waving Stars and Stripes flags and demanding the repeal of the Arizona legislation and calling for federal immigration reform. Pop star Gloria Estefan and Los Angeles Mayor Antonio Villaraigosa were among speakers who addressed marchers. "We need to write laws that appeal to our better angels," Villaraigosa told the crowd. Other marchers waved banners with slogans such as "Shame On Arizona," and "All Men Are Created Equal." The protest was one of more than 70 held across the United States as Hispanic organizations mobilized against Arizona's law. There were also clashes at a May Day march in the Chinese gambling mecca of Macau which injured 41 people, including two journalists and 32 policemen, the gambling hub's government said Sunday. Riot police in Macau used water cannon and pepper spray in Saturday's clashes with hundreds of protesters who fought with stones and bottles. The fighting erupted after protesters tried to force their way through police barricades to march along a main road where Macau's main casinos and tourist attractions are located. About 1,000 people joined the demonstration to demand job protection and action against illegal workers, Hong Kong's RTHK radio said. Tens of thousands filled a central square in Turkey's biggest city Istanbul for the first May Day celebrations at the site after dozens were killed there 33 years ago. Waving colourful flags, the crowds marched into Taksim square, the hub of the sprawling city, and chanted: "Shoulder to shoulder against fascists." The square had been declared off-limits since the bloodshed during a May Day rally there in 1977 when gunmen, believed to be far-right militants aided by members of the intelligence services, fired on a crowd, triggering mass panic. In Russia, diehard Communists hoisted red flags and portraits of wartime leader Joseph Stalin in a throw-back to Soviet-era parades and joining unionists to bemoan the economic crisis and call for a return to communism. An event in the country's restive North Caucasus region of Kabardino Balkaria was marred by a bomb blast that killed a 94-year-old veteran of World War II and injured nearly two dozen other people, according to news agencies. May Day rallies also drew hundreds of thousands of people in several French cities although the turnout disappointed unions who had called for a massive show of force against pension reform. In Ukraine, thousands chanted slogans such as "Socialism is our future", and in Serbia activists warned about the "worsening situation for workers" while in Romania opposition supporters in red shirts and caps targeted the government. German police rounded up about 50 leftists overnight for various incidents in the lead up to May Day. In Portugal, another heavily indebted euro area country, union leaders warned the government that "a tough budgetary policy imposed blindly could lead to disaster," said Manuel Carvalho da Silva, head of the country's main CGTP union and close to the Communist Party, who said 90,000 people marched on May Day. In Cuba, President Raul Castro presided over a May Day march staged as a show of unity in the face of what his government charges is a US and European-backed campaign to destroy the Cuban revolution. The United States was meanwhile braced for demonstrations in more than 70 cities with the largest rally expected in Los Angeles to protest at a tough new immigration law in Arizona that has triggered an outcry from rights groups. Organizer Nativo Lopez, president of the Mexican American Political Association, said the Arizona law "only gives working people, immigrants, youth, women, trade unionists and their sympathizers more reason to march." In Hong Kong, several thousand protestors marched through the streets to demand a minimum wage of 33 dollars (4.20 US) per hour and better job protection. Thousands marched through the Indonesian capital Jakarta demanding better social security and shouting "Today we unite" and "Stop oppression now." Some 15,000 security personnel stood guard, using water canon to suppress a scuffle near the palace. The Indonesian social security system only covered about 25 percent of workers, Indonesian Workers Association head Saepul Tavip told AFP.